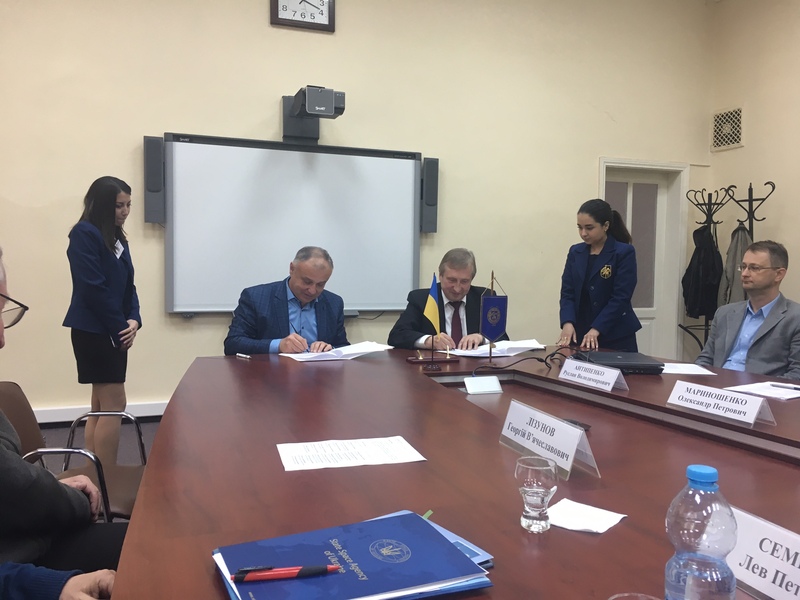 An agreement on cooperation between the Space Research Institute of NAS of Ukraine and SSA of Ukraine (Institute) and National Technical University «Igor Sikorsky Kyiv Polytechnic Institute» (KPI) was signed on May 18, 2017. On behalf of the Institute the Agreement was signed by director, corresponding member of NASU Oleg Fedorov, from KPI – by rector, academician of NASU Mykhailo Zgurovsky. The agreement provides for the creation of a joint research and training Center of Space Research and Technology (CSRT) to unite creative efforts in carrying out space activities. Director of the Institute Oleg Fedorov is appointed the scientific head of CSRT from the Institute as well as the Pro-Rector of KPI Mykhailo Ilchenko from KPI. Senior Research Fellow of the Institute Lev Semenov is defined the coordinator of CSRT from Institute's side and Vice-Rector for Research Vitalii Kotovskiy – from KPI. Composition of the CSRT, which includes leading scientists and representatives of the Institute and KPI was approved. Three working groups «Information Technology and Systems», «Scientific and service equipment of spacecrafts, micro and nano satellites», «Training and educational activities» will be formed as a part of CSRT. Ways of cooperation, joint activities and specific projects, which can be started, were discussed by participants before signing the document. «ERA-PLANET» project, presented by the Deputy Director of the Institute prof. Nataliia Kussul, is one of these projects. The purpose of the project is creation the European Research Area in the field of Earth research within the Group on Earth Observation (GEO) and Copernicus. The project is funded by the European Commission in the amount of 11 mln. euro. The project involved 35 European scientific organizations. Space Research Institute is the coordinator of project from Ukraine. Workshops of CSRT Council, approval of the working groups and the definition of priority activities for 2017 will be held in the near future.